Few perennials can top the daylily (Hemerocallis spp.) for colorful flowers that keep coming for several weeks during spring and summer. Available in thousands of cultivars with different features, the daylily gets its name from its characteristic of keeping each flower open for only one day. 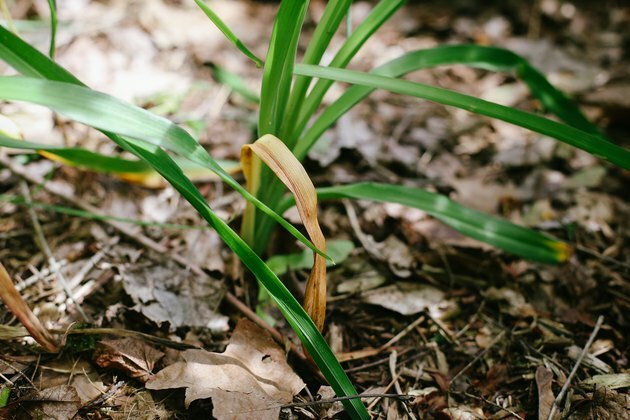 Although daylilies are usually simple to grow, it can be discouraging to see their leaves begin turning yellow, a situation that can result from a number of problems. Yellowing in daylilies at the end of their growing season is part of their annual cycle. Most daylilies grow as frost-hardy perennials in U.S. Department of Agriculture plant hardiness zones 2 through 10, with some variation among cultivars. They usually bloom from spring into summer, with the exact timing differing among the many varieties. When fall arrives and temperatures cool, daylily plants stop growing and their leaves start to turn yellow as photosynthesis -- the plants' manufacture of food -- stops. By late fall, the yellow leaves turn brown then gradually dry, collapsing around the plants' bases. In warm-winter areas, daylilies' leaves may undergo this change a bit later, in early winter, but eventually the plants become dormant in those regions, with new growth appearing the following spring. Daylilies are simple to care for once established, but young plants need regular moisture to put out good root systems that sustain growth. 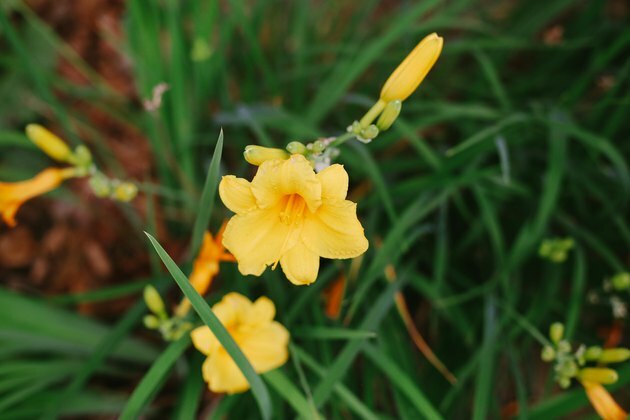 If newly planted daylilies develop yellow leaves that start turning brown, then the problem could be too little water. During the growing season, generally spring through early fall, daylilies' soil should not be allowed to dry out completely. For the best results, ensure the plants get about 1 inch of water weekly, including rain. Too much water -- either from constant rain or overwatering -- can promote root rot. 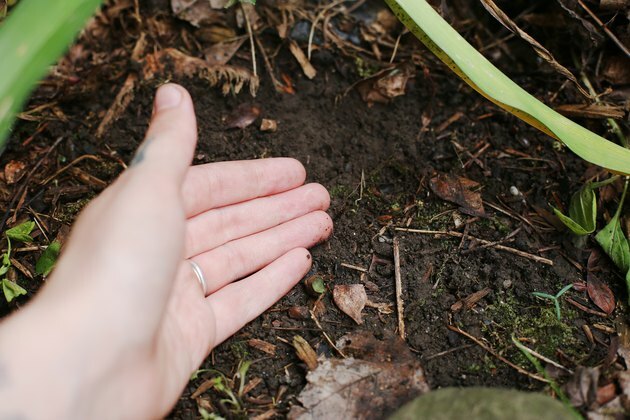 Roots become brown and slimy instead of being white and firm, and they're unable to take up soil nutrients, causing wilting and yellowing of leaves. Water daylilies only when their top 1 inch of soil feels dry to your fingertip, and don't plant them in a low spot that tends to stay wet for long periods. Daylilies are susceptible to two potentially serious diseases, which are called leaf streak and daylily rust and are caused by fungal organisms. As its name suggests, leaf streak results in long, yellow streaks on leaves, starting at leaf tips and with leaves eventually turning brown and dying. Daylily rust causes similar changes, along with orange spots on leaf undersides. Those problems can be prevented by only purchasing cultivars labeled as resistant to those diseases. Also, use a soaker hose or drip irrigation when watering daylilies to keep their foliage dry, space the plants at least 2 to 3 feet apart so their foliage doesn't touch and so their air circulation is good, and clear away plant debris often. You can also spray infected plants with a fungicide containing a chemical called myclobutanil, diluted at a rate of 1/2 fluid ounce per 1 gallon of water; use it every two weeks three or four times for leaf-streak infected plants, and use it every two weeks as needed for daylily rust-infected plants, but check your fungicide product's label for its specific directions. Prepare and spray the mixture only on a windless day, and wear goggles, a hat, a dust mask, and gloves and other clothing to cover your skin. Although daylilies are generally resistant to most pests, occasionally an infestation of a sucking insect may cause the plants' leaves to yellow. For example, thrips, which are 1/8th-inch-long, winged pests, can cause silver-to-yellow speckles on leaves. Aphids or mites also infest the plants, causing leaves to yellow and become deformed. Aphids are tiny, greenish insects while mites are not visible to the naked eye but produce weblike coverings that can be seen without a microscope on leaves. 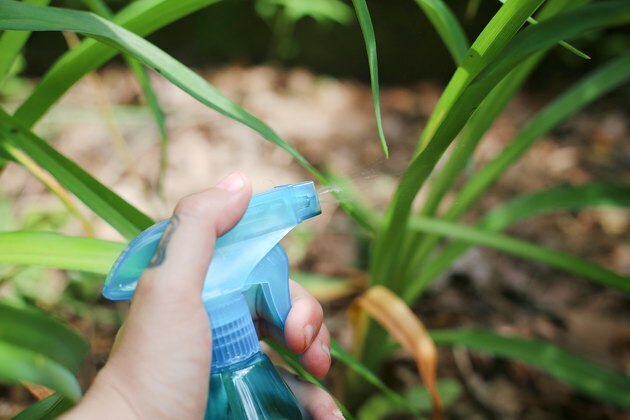 If you want to control thrips, aphids and mites, spray affected plants with insecticidal soap diluted at a rate of 5 tablespoons per 1 gallon of water. Repeat the application every two weeks as needed. 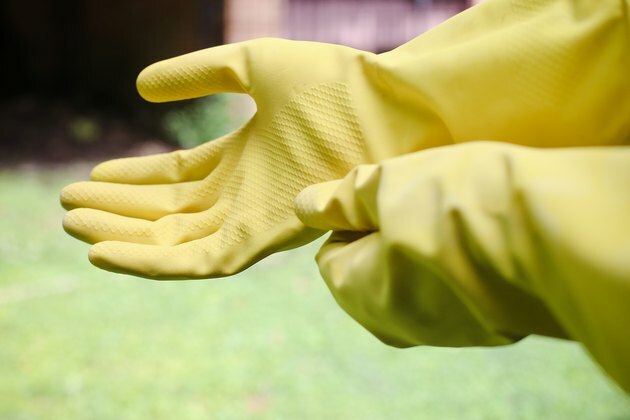 Prepare and spray the solution on only a windless day when the temperature is below 90 degrees Fahrenheit, and wear protective clothing.